PE/Cy5® Conjugation Kit ab102871 uses a simple and quick process to conjugate an antibody to PE/Cy5®. It can also be used to conjugate other proteins or peptides. Learn about buffer compatibility below; for incompatible buffers and low antibody concentrations, use our rapid antibody purification and concentration kits. Use the FAQ to learn more about the technology, or about conjugating other proteins and peptides to PE/Cy5®. 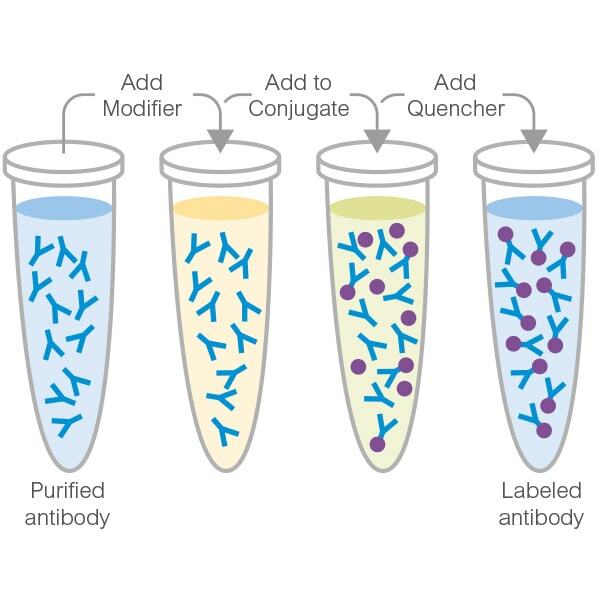 Amount and volume of antibody for conjugation to PE/Cy5®. Our Abpromise guarantee covers the use of ab102893 in the following tested applications. Inquiry: I would like to ask you about the sample preparation. I bought ab102893 PE/Cy5 Conjugation kit 100 ug, Lot: GR151075-3. The protocol recommend using 100ul of antibody with 100ug kit formats. And the recommended antibody concentration is 1-4 mg/ml. But the concentration of antibody that I can use is 0.3 mg/ml. Can I process as the conjugation protocol? Or, do you have any suggestion? Are any of the reagents in the EasyLink conjugation kit toxic to cells? "We commonly perform overnight conjugations here without adding the Quencher in the morning. The reactive chemicals have a short half-life, and should already be inactivated after an overnight conjugation. Unfortunately, we do not have any data on the effect of the kit components on live cells." As I mentioned in my earlier e-mail, many customers follow the shorter incubation protocol on the datasheet and stain live cells successfully. Following up my previous message, the laboratory does not have toxicity data but the assumption is that the reagents are not harmful to live cells, given that many customers have reported using Easy-Linked antibodies with their live cell samples, primarily in flow cytometry. Please let me know if you have any questions or concerns. The customer wants to buy 20 kits of EasyLink PE/Cy5® Conjugation Kit (1 x 1mg PE/Cy5®) (ab102893) .Therefore, she wants to know when she can get these kits? Would you please help her provide the information? Our customer advances an enquiry about EasyLink PE/Cy5® Conjugation Kit (1 x 1mg PE/Cy5®) (ab102893). She would like to know the currently in stock lot number of ab102893 and its corresponding quantity. Would you please help us deal with this issue? Thank you very much. Right now, we have two kits in stock; the lot. number is 1226982.